A beautiful Bordeaux winery and its grapes. There are many reasons France is the most popular country in the world to visit (84 million visitors in 2014, 9 million more than the second most popular country). Some of the reasons relate to Paris and its panoply of tourist sites, and perhaps because of the overwhelming appeal of Paris, many people overlook and ignore the rest of France. So in our July 2016 Bordeaux and Beyond cruise/tour, we showcase some of the best of the ‘forgotten France’. We optionally offer you time in Paris and then feature a brilliant one week cruise in lovely Bordeaux and a couple more nights in the heart of the Loire valley in the center of France’s ‘chateau region’. The lovely Amadolce, the ship that will be our deluxe ‘traveling hotel’ for our cruise. The cruise is on one of the great Amawaterways ships so you know it will be good. If you’re a wine lover, you’ll be overwhelmed by the chance to actually get close to where some of the world’s very greatest wines are made. The presence of an on-board guest wine specialist (the owner of a boutique Californian winery) who will provide lectures and other input on wine-appreciation, and careful wine pairings with meals (Amawaterways allow you unlimited wine and beer at both lunch and dinner on their cruises) is a further bonus. Chambord is the largest of the Loire valley chateaus, and we will be visiting it on the tour. If wine isn’t quite so much your thing, you’ve got lovely ancient towns, stunning castles and chateaus, UNESCO World Heritage Sites, and beautiful countryside to enjoy. Some days there are a choice of two off-ship tours, one more for wine lovers and one for people less interested in wine, making it well suited for everyone. July is a great time of year – warm but not as hot as the worst of August sometimes can be, low on rain, and with lovely long days and evenings. You might even want to help yourself to one of the ship’s free bicycles to cycle around the countryside a bit – with a relaxed itinerary and plenty of free time, you have considerable flexibility on how you fill in each day. Best of all, we’ve secured a great value for you. 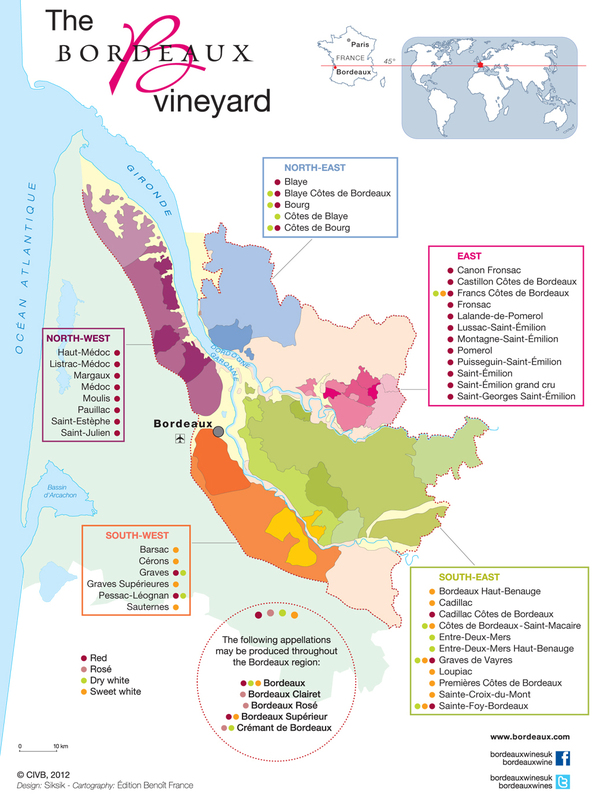 Click this small cropped map to open up a larger map showing the wine regions in the Bordeaux area. Take $750 per person off Amawaterways’ brochure price for the cruise, and that’s not all. We also give you a $100 per person shipboard credit which you can use any way you choose – drinks on board, salon appointments, gift shop purchases, and so on. Plus we pay the recommended gratuities on your behalf – that saves you probably about another $120 per person. Then there’s a special Travel Insider cocktail reception on board (I’ll be coming along too), and maybe another surprise or two in store for you also. If you’ve cruised with Amawaterways before, you’ll qualify for their $100 per person past cruiser discount, too. We’ve been allowed a ten cabin allotment (there are only 74 cabins on the ship) and we have these for a short while only. With this being a new itinerary for Amawaterways, we expect it will prove to be popular, so please do quickly confirm your desire to join some of your Travel Insiders on this great experience. Full information, a detailed day by day itinerary, and of course, a booking form are all to be found on/from this page . I hope to see you in July.